Lunch will follow in the church hall. With ways all her own, Mary Carter added much to the lives around her. A devoted and dedicated wife, mother, grandmother, and friend, everyone loved her outgoing nature. Although she could be opinionated, Mary was a welcoming woman who lived by way of example. It was a joy to share her company with her often sarcastic sense of humor, and she could take it as much as she could dish it out! Dearly loved by her family and friends, Mary will be fondly remembered. Mary’s story began on September 21, 1926, in Palmer, Massachusetts just as the warmth of summer was transitioning into fall. The daughter of William and Anna (Sullivan) Costello, it was an exciting time in our nation during the heyday of the Roaring Twenties when Big Bands were king, and Prohibition was law of the land. Major U.S. manufacturers were implementing the beginning of the first eight hour, five day work week, and factory towns were flourishing. Mary Elaine was the eldest child in her family and was later joined by two younger brothers, Richard and Billy. Proud of their Irish roots, both of Mary’s parents were full-blooded Irish. 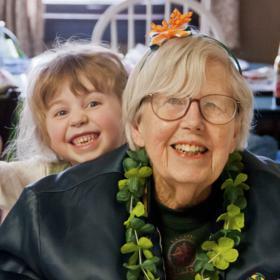 Mary grew up in Springfield, Massachusetts nestled in the Irish neighborhood of Hungry Hill.  Mary attended the local schools and went on to attend Commerce High School. 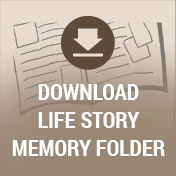 Although World War II was news of the day, much was being done on the home front for the war effort. Even so, Mary loved high school and counted it as the best times of her life. She had many friends and the dance craze was all the rage. She even played some tennis before graduating with the Class of 1944. Shortly after high school, Mary landed a job at Westinghouse as a secretary in the purchasing department where she remained for ten years. Her father was a singer, so it only followed that with Mary’s signing voice, she was in the company’s chorus line. It was during this time in Mary’s life when a handsome gentleman named John “Jack” Carter swept her off her feet. Having been transferred to the Westover Air Force Base near Springfield during the Korean War, Jack stopped at one of the local dance halls looking for his buddies. When they got back to his car, Mary and two of her friends were standing nearby before they decided to leave. Jack had eyes for Mary from the moment he saw her. They proceeded to follow the girls to a pizza parlor to get a grinder where they ended up putting tables together as a group. After staying until closing time, Jack went out to help Mary down the steps. They kept talking even as her friends kept beeping the car horn to break them up, and soon their night came to an end. Mary served as a hostess at Westover’s NCO club and even though Jack didn’t have the rank to enter, he snuck in to see Mary the next night. They shared a memorable dance and at the evening’s end he drove Mary home. Just prior to Christmas of 1952, it was only the beginning of their romance. They wrote to one another and their love blossomed. 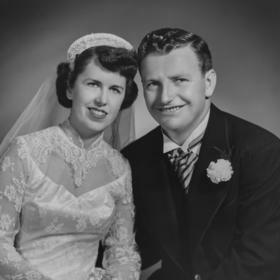 In July of 1954, Jack proposed to Mary at the Bloody Bucket Bar in South Haven where Jack was raised, and on November 6, 1954, they were happily married in Springfield at Our Lady of Hope Church. After spending their honeymoon in New Orleans, Louisiana, the couple began what would become 63 years together as husband and wife. 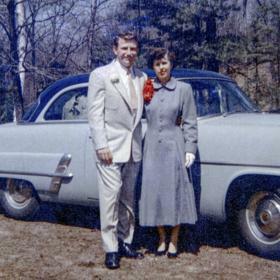 Mary moved to Michigan and in the early years of their marriage Mary and Jack lived in Glenn, Michigan, near South Haven on Blue Star Highway on his family farm. In this little house they began a family of their own with the birth of Tim, and Chris followed. They eventually moved down the road to a larger home in 1964 and daughters, JoAnn and Kathy came along. Mary loved nothing more than raising their family. Perhaps it was growing up during meager times, but Mary really knew how to stretch a dollar. She ran a small daycare out of their home when her kids were little. As a family they enjoyed fun-filled vacations. They visited 46 states in their travel trailer and then motor home, taking in the sights of many historic places and national parks. Mary was the business manager of the house, and later when Jack had his truck driving business she ran the business, too. Mary was very good at managing money. Classic snowbirds, when Jack retired they wintered in Arizona for many years in their motor home as well as in Texas and Florida. Devoted to their Catholic faith, Mary and her family were active members of their church in Allegan. 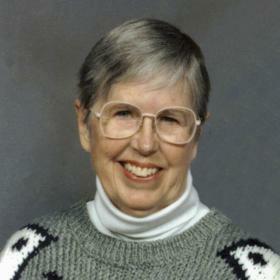 She oversaw the altar boys schedule and was a tremendous help with Marriage Encounters. Square dancing was a big part of Mary and Jack’s social life and without fail they went out every Wednesday night. Mary loved music, especially the sounds of her youth like the big bands and swing, and of course, Irish tunes. There was always an organ in their house that Mary played a little and she still liked singing. She was ever proud of her Irish heritage. Good grammar was important to her, as was a knowledge of American History. Mary’s free time was spent reading. She loved detective novels and watched soap operas, especially “The Edge of Night” along with her cup of coffee. This was Mary’s time and the kids were sent outside to play! When it came to being a mother, Mary was attentive and caring. She attended all of their sports and school activities, even though she never drove. Close to Mary’s heart was her love for Christmas. They gathered for midnight Mass, then went home to open gifts before heading out for their drive to Massachusetts to spend time with her side of the family. Mary never worried about celebrating holidays on the actual day. When it was time for family gatherings, Mary’s preferred drink of choice was a good glass of Boone’s Farm! A very outgoing woman, Mary was always on the go and rarely met a stranger. Even though she had her share of opinions, her sarcastic sense of humor was met with much laughter. In Mary's final years, Jack cared for her at home until her health issues, including dementia, became too great to manage on his own. For the last year and a half, Mary resided at the Alamo Nursing Home. In a way, those who knew and loved Mary have lost her twice, but in all ways, she will be remembered for her fun-loving nature. Never to be forgotten, Mary will be deeply missed for all that she was. Mary Elaine Carter, age 90 of Kalamazoo, died August 15, 2017 at Alamo Nursing Home. She was preceded in death by her brother, Richard Costello. Surviving is her husband of 63 years, John “Jack” Carter; 4 children: Tim Carter (Lori Mattheiss), Chris (Sheryl) Carter, JoAnn (Ed) Dunning and Kathy Carter (Kat Tragos); 4 grandchildren: Matt Carter, and Catherine Ann, Lauren Grace and Declan Jack Dunning; brother, Billy Costello and many nieces and nephews. Visit with family and friends while sharing food and drinks on Thursday (Aug. 24) from 5-7pm at the Betzler Life Story Funeral Home, 6080 Stadium Dr. Kalamazoo (269) 375-2900. Mass of Christian Burial will be celebrated Friday (Aug. 25) 10:30am at St. Joseph Church. A luncheon will follow in the church hall. Burial will take place at Riverside Cemetery. 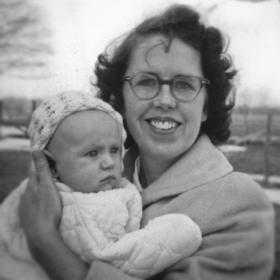 Please visit Mary’s personal web page at www.betzlerfuneralhome.com, where you can read her story, archive a favorite memory or photo and sign her online guestbook before coming to the funeral home. Memorial contributions may be made in her name to the Red Cloud Indian School in Pine Ridge, SD, or to Right to Life.